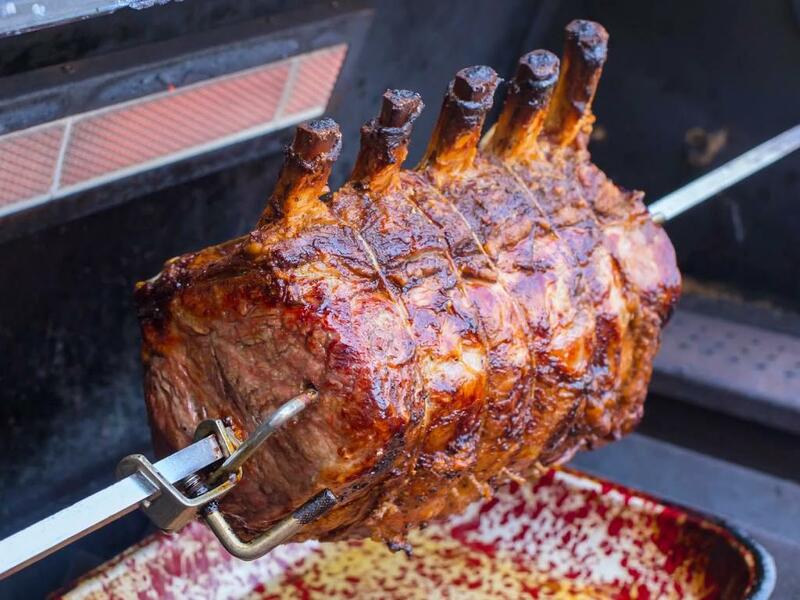 Rib roast is the best way to show off beef on the rotisserie. Cooked on the bone, seasoned with salt and pepper, served with horseradish sauce on the side. Simple and delicious. If you are feeding carnivores, this is the recipe to make. I call this roast a “Prime Rib”, and so do grocery stores, but most of the time that’s not technically correct. Prime rib has become a generic name for a beef rib roast, regardless of grade. When the USDA grades meat, only the top 2% is graded Prime. Almost all of the meat we buy in stores is graded Choice; the vast majority of Prime grade beef goes to high-end steakhouses. Grading is based on marbling - the amount of fat inside the muscle. Fat on the outside isn’t as important; look for tiny veins of fat inside the meat. That interior fat melts during cooking, filling the beef with flavor. Prime meat is loaded with marbling. Choice meat is less marbled, but still has a decent amount of intramuscular fat. USDA Prime meat is amazing…if you are lucky enough to find it, and can afford it. I buy Choice roasts and save expensive Prime meat for the occasional steak. I look for Certified Angus Beef, which grades out at the high end of Choice. Or, I buy from a local butcher who raises his own cattle. It never hurts to pay extra for good beef. 1. Dry brine the beef: Season the rib roast with the salt and pepper. Refrigerate for at least two hours, preferably overnight. 2. Truss and spit the beef: One hour before cooking, remove the rib roast from the refrigerator. Truss the roast, tying it between each rib bone, then skewer it on the rotisserie spit, securing it with the spit forks. Let the beef rest at room temperature until the grill is pre-heated. Submerge the smoking chips in water and let it soak until the grill is ready. 4. Set up the grill for indirect medium-high heat: Set the grill up for indirect medium-high heat with the drip pan in the middle of the grill. 5. Cook the rib roast: Put the spit on the grill, start the motor spinning, and make sure the drip pan is centered beneath the rib roast. Add the smoking wood to the fire, close the lid, and cook the beef until it reaches your desired temperature in its thickest part, about 2 hours. 6. Serve: Remove the rib roast from the rotisserie spit and remove the twine trussing the roast. Be careful - the spit and forks are blazing hot. Let the beef rest for 15 minutes, and while the beef is resting, whisk together the ingredients for the horseradish sauce. To carve the beef, cut the bones off of the roast, then slice the roast and serve. I pour the juices from my cutting board into a small serving dish to pass at the table. This is a large roast and will feed a crowd. Assume one pound of beef per person. Unless you have some dedicated carnivores…like my family. Then you should probably go with one bone per two people, and this roast will serve eight.